This is the 64th in a series of posts on the Fujifilm GFX-50S. The series starts here. I’ve changed the target back to the backlit razor blade. This sis the best target I have for not limiting the results due to fuzziness in the target itself, and, for that reason, having the results not depend on target distance. I couldn’t us it with a lens as short as the 23, but I can with the 110. This makes the results directly comparable with thos I’ve done with the razor blade in the past, but means that the numbers will be apples to the 23 mm test results’ oranges. I’ve gone to a vertical orientation for the razor blade. A horizontal slanted edge is really hard to focus on, which means that some times the sharpest point in the motorized rail travel wasn’t in the middle of the rail. In fact, sometimes it wasn’t in the whole series, which would mean that I’d have to go back and reshoot, or leave that data out. This situation is made worse in a lens with a lot of focus shift, where the distance from the sharpest point at one aperture and that at another can use up a lot of the available rail travel. Because the focus peaking in all the mirrorless cameras that I’ve tested is tuned for vertical edges, this orientation makes it easier to focus. I’m using electronic shutter. 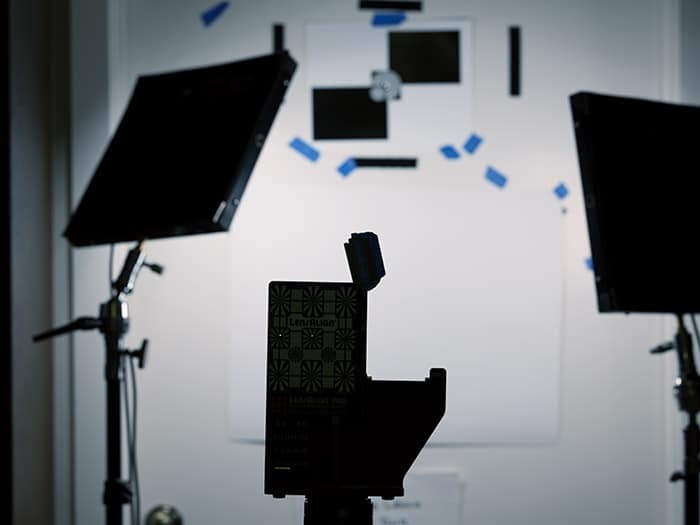 Going to a vertical orientation makes the results more sensitive to vibration in the horizontal direction, which is the direction that a tripod is the worst at resisting. Using ES means that there are fewer vibrations from the preceding shot that have to have damped down by the time the next one happens. I changed the target distance to 2 meters. This is a more representative subject distance than the 80 cm I was forced to use with the 23 mm lens. 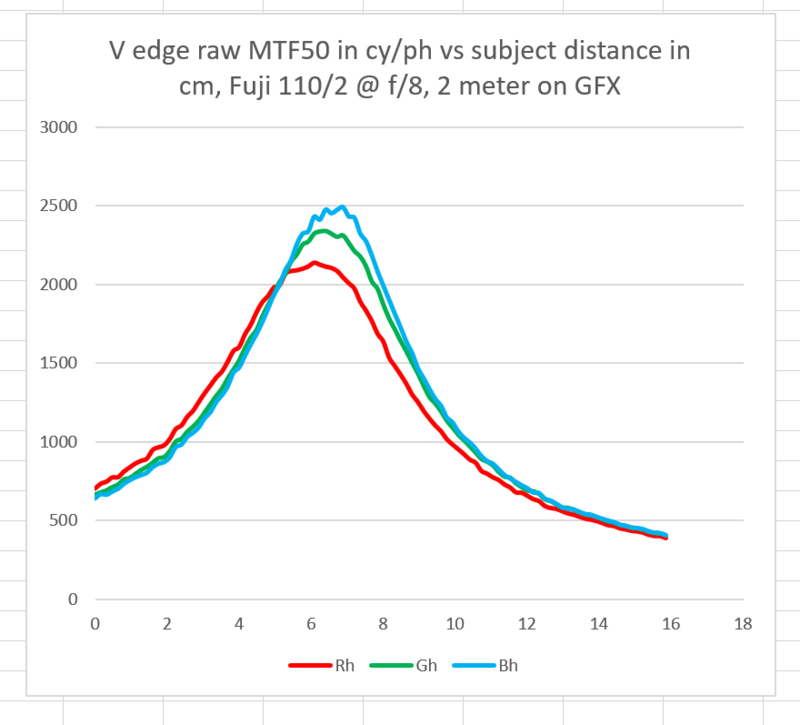 The vertical axis is MTF50, measured in cycles per picture height (cy/ph). The horizontal axis is camera position shift in cm. 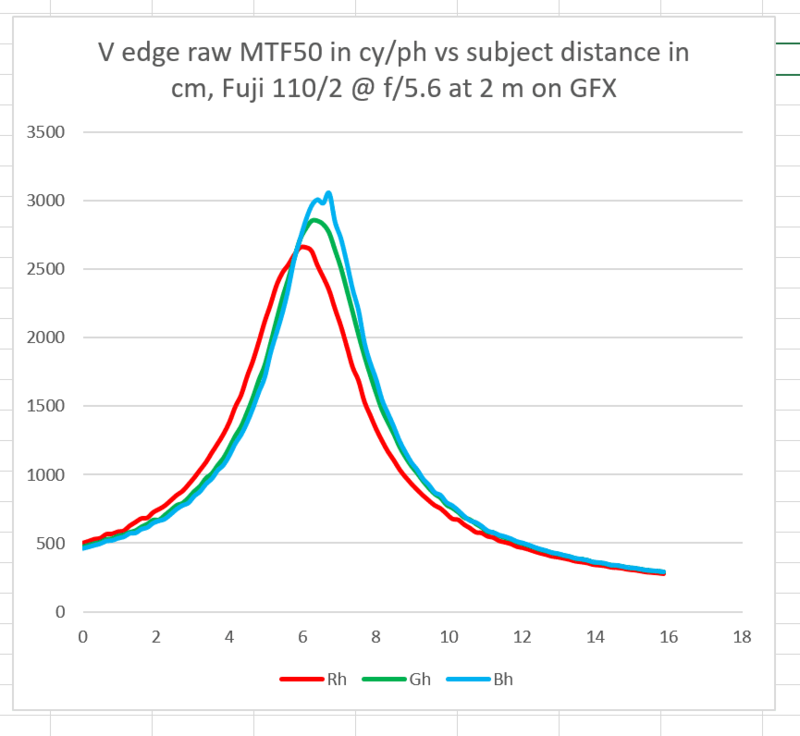 The points on the left side of the graph are with the camera farther away from the subject than the points on the right. Wide open, the red and green channel performance is very impressive, but the blue channel lags badly. If you had to pick a channel to be off the pace, blue would be your choice. There is a tiny bi tof LoCA visible as the peaks don’t all occur at exactly the same place, but this lens is we” corrected for LoCA. This is an incredibly good. Not only are the numbers really high, the peaks all occur in about the same place. At f/4, the red channel peak shift a bit further away from the other two, but this is still excellent performance. The trend continues at f/5.6, with still great results. At f/8, things are deteriorating due to diffraction — as they have been since f/2.8 — but are still quite good. At f/11, there is essentially no LoCA, and the tiny bit that there is will be covered up by DOF. With respost to LoCa, this is a marvellously well corrected lens. 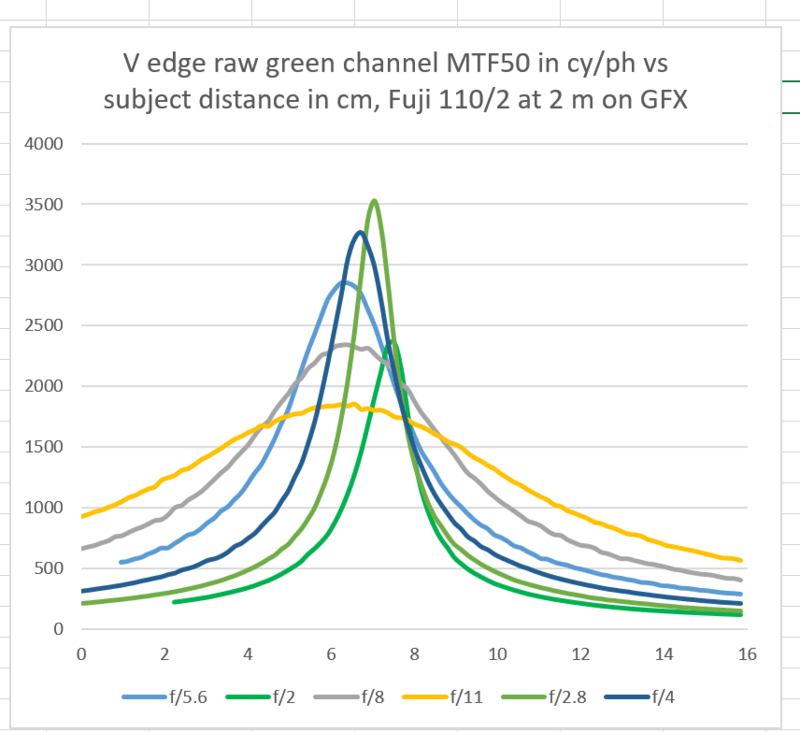 Putting all the green channel curves on one plot lets us look at focus shift. There is enough focus shift that you’ll want to focus this lens at the taking aperture at f/2 and f/2.8. All smaller apertures can be focused at f/4, or f/5.6 if you’re really picky. These curves are not smoothed at all. You are looking at the values that MTF Mapper calculated for each data point. There is very little noise. That tells me that MTF Mapper does better with the high-contrast, super-sharp (so sharp, you can literally cut your finger on it if your not careful) target, and that vibration is under control, possibly thanks to the electronic shutter. For a comparison, consider the f/2.8 LoCA curve that I made some time ago for the Zeiss 85 mm f/1.4 Otus on the Sony a7RII a while back with the same target (this time positioned horizontally. f/2 and f/2.8 tie for the Otus 85’s best f-stop. The target was a little closer here. The 110/2 is a great lens. I can’t tell if it’s as great as the Otus 85 without an optical bench,a nd even then the answer would depend on how one weights the various measurements. 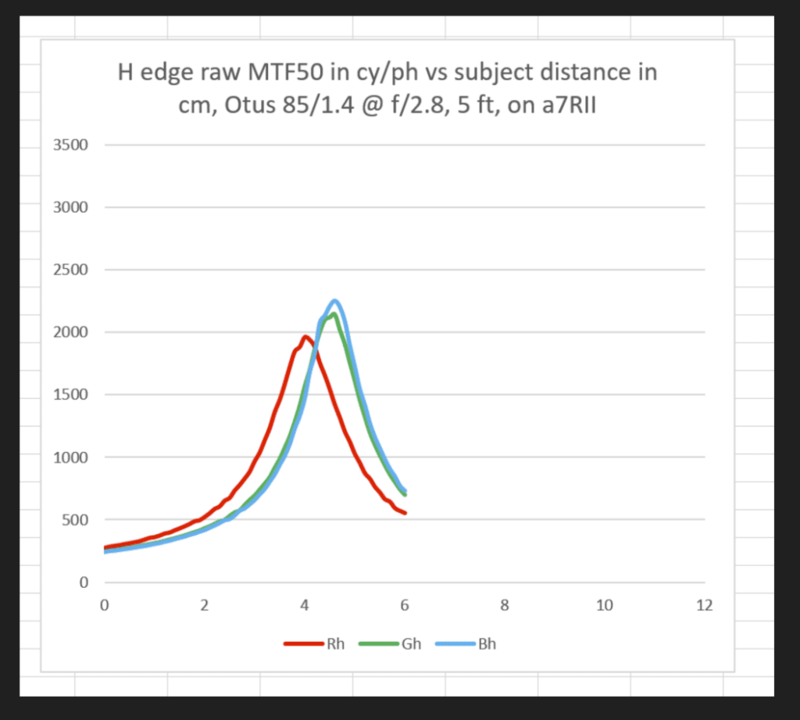 The Fuji 110 is better corrected for LoCA than the Otus. All I can say is, “wow!”. Wow indeed. And great looking curves. When comparing different formats it may be worth mentioning a couple of values in lp/mm. 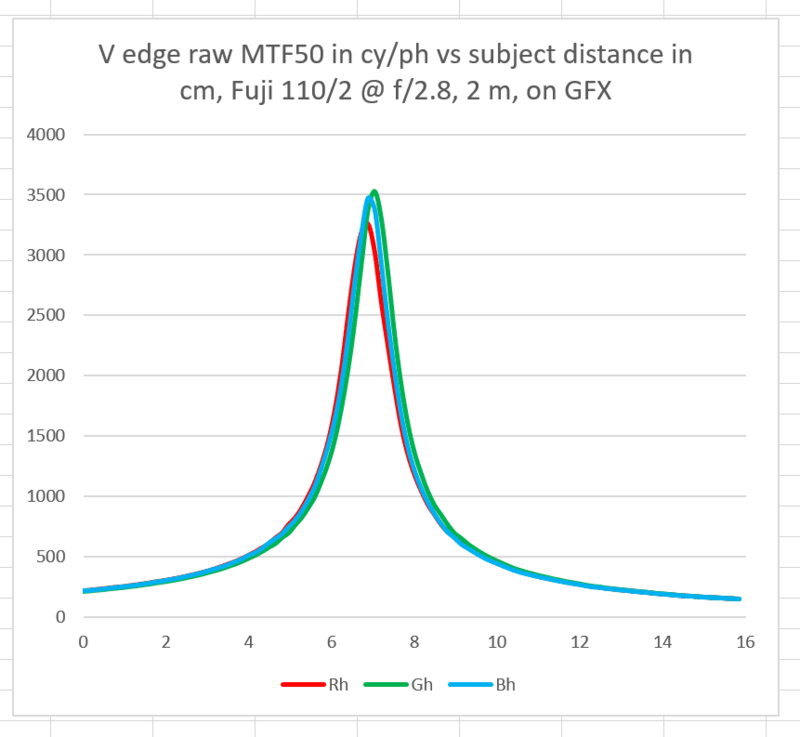 For instance, using sensor height, 2250 lp/ph on the a7RII+85mmOtus = about 94 lp/mm; 3500 lp/ph on the GFX+110mm = about 106 lp/mm. And they both clock in at or above 0.5 c/p with all that that entails. Re-Wow. 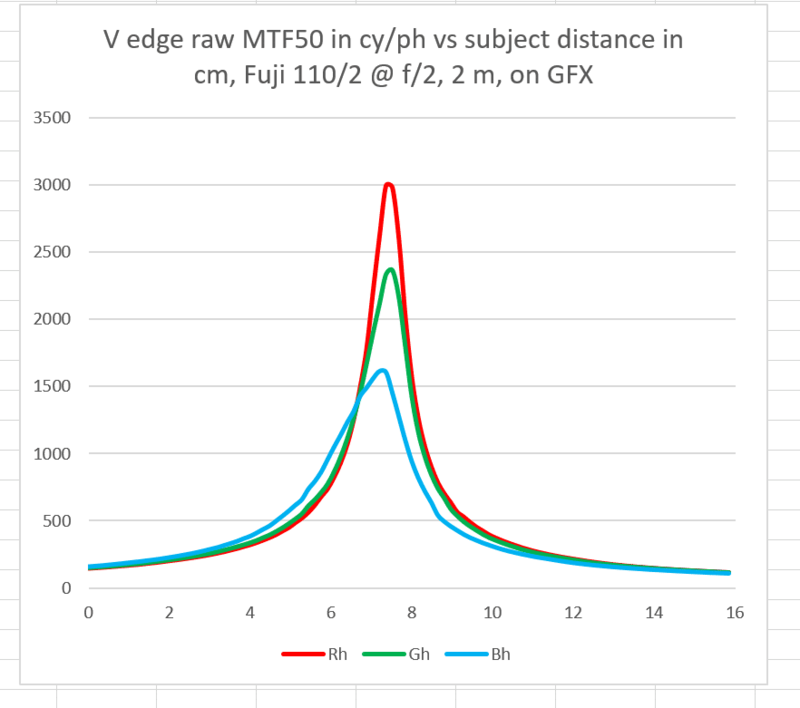 I cannot reconcile the difference between the R-G-B channels at f/2 with spherochromatism — there is not enough chromatic focal shift as a function of f/# to match. I am guessing it is an artifact of the microlenses or otherwise sensor related to disappear so quickly. Thanks for your insights. Those lenses are not what we usually see on modern sensors, are they? Seems so. I’d love to get some of them on Olaf’s bench, but the max image height of ~20mm falls a bit short of reaching the corners of crop MFD. Zeiss have always been particulary bad when it comes to LoCa. I think its first on the list of optical compromises when they design a lens. The MP 100 f2 comes to mind as a particularly bad example but even the 85 otis was coming up short to a Venus lens (the 105mm F2) on a comparison on Flickr. LoCa is stuff that shows up mostly in OoF images as magenta green fringing. It is hard to correct in software, but stopping down masks it. 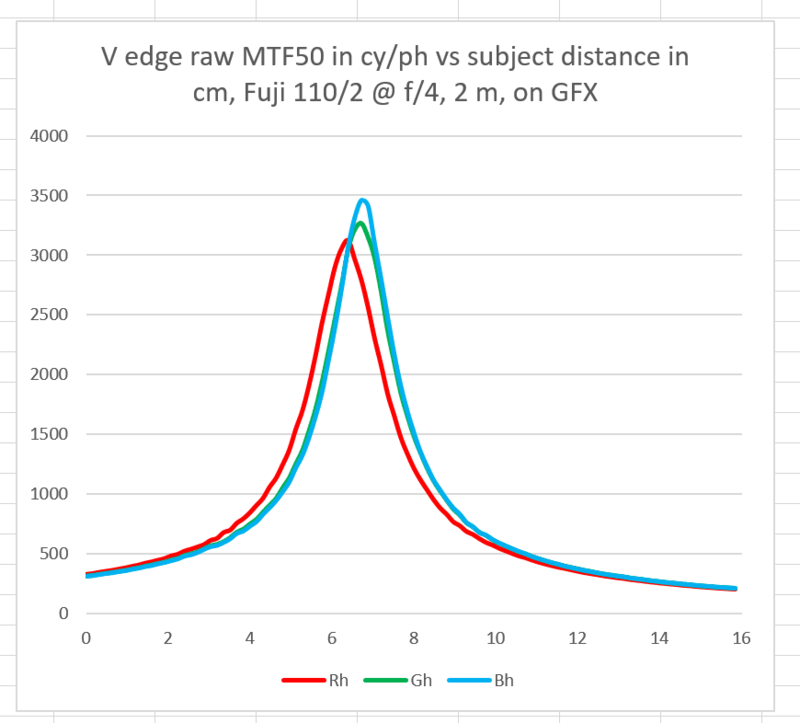 As far as I know the Otus lenses don’t show OoF colour fringing at maximum aperture and they reach optimum MTF (or whatever we measure) at something like f/2.8 or f/4. That is what I call good enough. For me, it is actually more than good enough, as I am pretty much an f/8 shooter. Yeah, f/1.4 or f/2.8 is great if we shoot things with well defined focus. So, for my needs a decent quality zoom lens, like the Canon 16-35/4L just works fine, while shooting at f/1.4 is not what a landscape (etc.) shooter like me does very often. If some of the GFX lenses are as well corrected as the Otuses, that is really great. 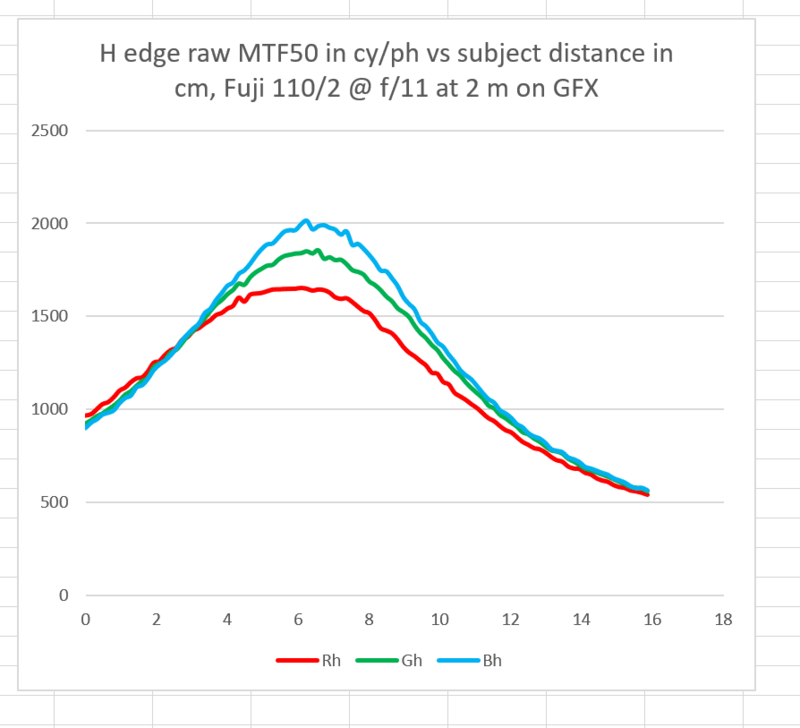 Something that we need to keep in mind that Jim’s measured data is essentially near optical axis, so that says little about optical correction of borders and corners. Whatever, it is nice that Fujifilm makes a great camera, exceeding what is possible with 24×36 mm with great lenses and at an affordable price point. Still, I don’t see myself as future MFD buyer. I don’t often print very large, mostly A2 (16″ x 23″) and sometimes 70x100cm ( 27″ x 39″) and even my nine year old Sony A900 could produce decent images at that size. Perfectly happy with my Sony A7rII. The flange distance on that camera gives a lot of interesting options for tilt and shift and it delivers all the image quality I need. Absolutely nothing wrong going higher in image quality but the A7rII delivers what I feel I need with a great flexibility. On the other hand, congrats to GFX buyers, it is a great system and it will be even better in a few months/years. My understanding is also that Fuji is good at improving firmware in existing cameras, based on the experience with their APS-C systems.